The agreement with the Seattle Symphony & Opera Players’ Organization increases musicians’ salaries by 12% over four years and introduces a groundbreaking pension plan. 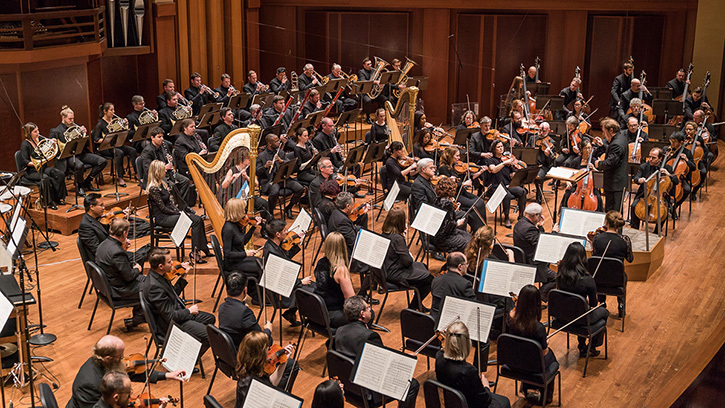 Today the Seattle Symphony and the Seattle Symphony & Opera Players' Organization (SSOPO) — the labor organization representing the musicians — announced a four-year contract extension, five months prior to the expiration of the current contract. The agreement includes wage increases, a groundbreaking new pension plan and provisions that will help contain cost increases in health insurance. The previous contract extension expires August 31, 2018, and the new extension will be in effect from today through August 31, 2022. Seattle Symphony musicians are employed for 47 weeks each year by the Seattle Symphony and Seattle Opera. The current base salary is $98,100. The musicians’ base salary will increase by 3.9% in year 1, 2.5% in year 2, 2.4% in year 3, and 2.6% in year 4, reaching a final base salary of $109,745. The agreement also includes provisions to help contain cost increases on the health care plans. This unique pension plan agreement came about when the parties agreed to explore alternatives to the pension plan design to reduce financial risk for the employer and increase benefits for musicians. The pension plan remains a defined benefit plan but with a new funding model using a relatively new plan, the Milliman Sustainable Income Plan (SIP). The SIP has predictable and consistent employer costs while providing the musicians with the potential for increased benefits over time, even in retirement. The Seattle Symphony is the first orchestra to adopt the SIP on behalf of its musicians. The Seattle Symphony also announced its audited financial results from the 2016–2017 season today. The season ended with increases in both ticket sales and fundraising, resulting in a surplus of $753,000 on a budget of $29.7 million. The combined operating budget for Seattle Symphony and Benaroya Hall is $33.3 million. The Seattle Symphony would like to thank the musicians’ negotiating committee. In addition to the chair, Alexander White, additional members of the committee were: Timothy Hale (Viola), Zartouhi Dombourian-Eby (Flute/Piccolo), David Gordon (Principal Trumpet), Jeffrey Barker (Associate Principal Flute), Eric Jacobs (Clarinet/Bass Clarinet), and Jonathan Karschney (Assistant Principal Horn). Also at the negotiating table on behalf of the employer were Vice President & General Manager Jennifer Adair and Vice President & Chief Financial Officer Maureen Campbell Melville. For more information about the agreement, read the press release from the Seattle Symphony and the Seattle Symphony & Opera Players’ Organization. Piccolo Zartouhi Dombourian-Eby’s position is endowed by Robert and Clodagh Ash. Principal Trumpet David Gordon’s position is endowed by The Boeing Company.